2019 was a challenging year for the Running of the Leprechauns. The race was originally scheduled for Saturday at the Malden Irish American Club. From what I have heard there was an issue with the permit so the race had to move. This may have been due to the Malden Half Marathon and 5 Miler that took place the week before. That race had it’s own permitting issues and the half marathon ended up being 5 2.5 mile loops plus a bit more. I liked that format but many did not. I think that towns are finding that they can only inconvenience their citizens so many times before the phone at city hall starts ringing. I can’t imagine any mayor would not want to encourage healthy activities like road races. Not only do they reflect positively on the community but an influx of runners brings patrons to local businesses. I saw Medford’s mayor at The Running of The Leprechauns, so I am assuming the race had her support. I say Malden’s loss is Medford’s gain! The race was about 1.75 miles from my house so I ran over with fellow MRC member Marty Hergert. We were using it as our pre-race warm up. When we got to The American Legion Hall there was a line out the door for bib pickup. I should have picked up on Saturday! After my run across town I was a bit sweaty and the cold began to sink in. When I got to the table Kelly Catallo checked me in. She looked a little frazzled and said she hate’s it when she’s behind schedule. I didn’t ask what was going on, but I’m guessing they got into the hall late? The hall was all set up and the food was out, so I’m not 100% sure what happened. She must have a great group of volunteers, because everything else was ready to go. After I got my bib I wandered around inside the hall and saw Mike and Judy Dolan and a few other people from the club. I saw they had pictures of water on the bar so I headed over to get some pre-raced hydration. Around 8:00 the hall was still packed with runners and no one knew when the race would start. Kelly came in and apologized for being behind schedule and asked us to start heading outside for the kid’s run. Kelly had the crowd yell out the “Ready, Set Go!” for the kids. I was close enough to see about 10 kids of various ages take off. Most toddled along or went a few feet and looked for Mom to pick them up. It was still cute as hell! Kids are still figuring out how to move their bodies so they always look so awkward running, and damned cute too! After a few minutes they were ready for us to line up. I made my way through the crowd and a few people with strollers who should have been looking to line up in the back. Why people don’t line up like they should is beyond me. At 8:15 we got the command to Go! I was near the front and did my best to keep up with the lead pack. It was a small pack of about 25 people and I knew some of them had gone out too fast. I also knew that there were people behind me who were much younger and in much better shape who would be blowing past me shortly. By the time we got to Lawrence Road the lead pack had spaced out and a few people passed me. As we headed up our first hill I kicked it into hill gear and kept up with the younger runners I was with. By the time we passed the driveway for Medford High it was beginning to feel like a race. I felt appropriately dressed for once. It was a little cool, I was sweating a bit and it was about right. My winter running hat also felt like the right choice. Sometimes I get lucky! I ran mile one at 7:57. Not blazing fast but we did cover 46 feet of elevation gain. I felt okay and told my self that the initial shot of energy was spent and now the real running would begin. I’ve run this course probably ten times. 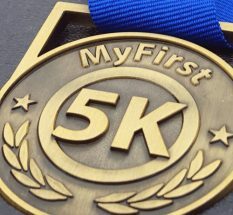 The Granara-Skerry 5K and Medford Jingle Bell Run 5K have used this USATF certified course. Granara-Skerry used this route for about ten years and paid for the USATF Certification. I’ve seen the map and know where the turn around is supposed to be. As an out and back course, the turn around point is pretty simple. The map even gives the address of the house the turn around should take place in front of. Usually the course is close enough. But I ran The Medford Jingle Bell Run at around 2.9 miles once and we ran The Running of The Leprechauns 6 at 3.31 miles. As we approached the turn around I knew it was too far. Usually I see the lead pack heading back before I am able to see the turn around point, and I wasn’t running an aggressive race. I didn’t even need to look at my watch to know the turn was too far out. They had placed the cone at the end of the yellow median stripe which was almost in the traffic circle in Winchester. It really bothered me that a cop could not look at a map and find an address. They look for addresses every day don’t they? Above all else runners want an accurate course and correct timing. Shirts and medals are way down the list, below correct race information, food and water. But it was what it was. We were running down hill to the turn and we would be running uphill after the turn. My legs still had enough juice that I knew I could push up the hill and make some time. I hit mile two at 7:48 while still running up the hill. Mile one was 7:57 so I was warmed up and ready to tackle mile three. For the first quarter mile or so after the turn we could see everyone still heading out. My glasses were dark and the sun was causing a lot of glare so I couldn’t see people very well. I heard Judy Dolan call my name but I only recognized her by her voice. Someone else called my name but I had no idea who they were! I also saw Mike Dolan and Sam Bookman. As we approached 2.5 miles I recognized Marty Hergert’s shirt and realized I was gaining on him. He was about 20 meters in front of me and I wasn’t sure I could continue to close the gap. How did I miss those socks? As I caught up to him he said. “You’re going to pass me again” and I didn’t even see him look over his shoulder at me! I did pass him for a bit and then he passed me. We hit mile three about a third of a mile before the finish line. Way too far out. Marty and I were running side by side for the most part. I told him to go for it and he took off with little apparent effort. He finished a few meters in front of me. As I approached the finish line 25 was already on the clock. I knew the course was long but all of my miles had been under 8 minutes, so I should have had a shot at a 24 minute race. After I got a water and my finisher’s medal I wandered around the finisher’s area to catch my breath and watch runners come in. As I walked around a guy said, “How was your race?” Pretty standard thing to say after a race. Then he said “my name is Dave, not sure if you remember me.” I was clueless! Then he told me that he was the guy who helped me after I fell during the Friends of The Fells 10K trail race in 2017! I was floored. He must have recognized the club singlet or something. We chatted for a bit and headed inside along with Marty to get warm and some food. I’m horrible with names and this guy remembered me from almost two years ago. The hall wasn’t too busy yet. The ladies claimed a table before the race so I left my gloves on the table and headed for the coffee. They had nice 16oz cups and a half gallon of cream. Perfect. They also had donuts and a hot breakfast for us! You can’t beat that on a cold day. I went down the line and they gave me more food than I needed, but I did manage to clear my plate! Later at the table someone said they had run out of cream! They went through a half gallon in less than 45 minutes! Wow. We had a good time talking and sharing stories about the race and our next adventures. Marty had to get home and his car was parked at my house. He was pretty sure he knew the way back but I finished up my conversation with Mike Dolan and we headed back to my house. When I turned my watch back on for the run home, somehow it just added the miles to my race. As we headed down Winthrop Street our legs were a little tight at first, but we loosened up and did okay. In spite of the issues Kelly had to work through, she made it and we all had a good race. Here’s looking to next year’s race!